Are you concerned about a grizzly bear entering your classroom? Neither am I. However, as educators, many of us are deeply worried about other dangers lurking around our schools, such as xenophobia, racism, sexism, and the erosion of democracy. At PAWLP, we have been reflecting on the meaning of advocacy for teachers — finding a focus, garnering support, identifying meaningful and sustainable actions to take… Now, many of us see advocacy as an integral part of our identity and mission as teachers. At our Saturday Continuity sessions, we are engaging in reflective writing, sharing of ideas, and action planning to move forward in purposeful ways within our schools and larger communities. Please join us on February 3rd and April 8th, from 10:00-11:30 at the PAWLP office for collegial connection and inspiration. Are you interested in ways to nurture creativity and empathy in your classroom? I am. On March 18th, we will have our Spring Saturday Seminar at the West Chester University Graduate Center. The theme this year is “Infusing the ARTS across the Curriculum.” Dr. Pauline Schmidt, PAWLP’s Associate Director, will set the context for the day with an invitation to explore the arts as essential to engagement, empathy, and critical thinking. Our keynote speaker will be the award-winning poet/educator/activist Janet Wong. She will provide energizing strategies to immerse our students in poetry through interactive, multisensory experiences. Following Janet’s keynote, we will have a menu of breakout sessions, facilitated by PAWLP fellows, related to the theme of the role of the arts across the curriculum. The day will end with an author/illustrator panel, including Jennie Brown, Jan Cheripko, Adam Lehrhaupt, and Nancy Viau. There will also be opportunities for book browsing and author signings. 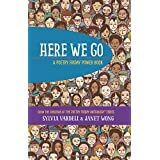 Of particular relevance, and something that you might want to read, whether you’ll be joining us on March 18th or not, is Sylvia Vardell and Janet Wong’s most recent book, Here We Go: A Poetry Friday Power Book. The book has an inviting and interactive format. It is divided into twelve sections, called “Powerpacks.” Each Powerpack contains an anchor poem written by a guest poet (including Naomi Shihab Nye, Joseph Bruchac, Eileen Spinelli, and several others), a response poem (written by Wong in the voice of one of four child narrators), a mentor poem (also written by Wong, in a different child’s voice), and a “Power2You Writing Prompt,” which invites the reader to write in response the previous poems. The magic of the book is that each of these Powerpacks works together to tell a story, narrated cohesively by the voices of the four children of Wong’s creation. We hope to see many of you at our Continuity sessions on February 3rd and April 8th, as well as at our Spring Saturday Seminar on March 18th. Go to www.pawlp.org for more information about these and other collegial opportunities. We need advocacy and we need the arts. Most of all, we need each other to sustain the energy to move forward in this most challenging time. Please join the conversation — share your thoughts about the role of advocacy and/or the arts in your teaching situation, in the comment section below. Janet, we can’t wait to see you! We’re interested in the intersection of advocacy and the arts, and look forward to continuing that exploration with you. One of the many things that I will talk about: using poetry & art to make positive (generic pro-social) protest signs featuring catchy & meaningful slogans. Goodness knows (sadly) we’ll have plenty of opportunities to use these over the next several years! Yes, protest signs of all kinds are a very relevant form of artistic expression! Rita: I’ll share details about the PowerPacks on 3/18–see you there!